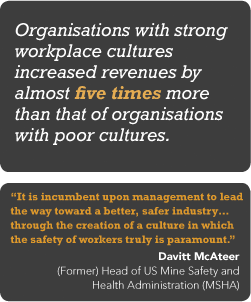 We help leaders and employees to understand how workplace culture impacts people’s safety and performance. We show people how their personal behaviour typically reinforces existing cultures – and help them understand the impact of a more positive, safe and productive culture. Once people gain these insights, there’s typically a huge change in their mindsets. Then we’re able to hit the ‘go’ button and change behaviours accordingly.